Tennessee Titans safety Kevin Byard is entering his second year in the NFL and first as a full-time starter, but according to ESPN’s Cameron Wolfe, many within the organization feel he’s destined for stardom. Tabbed by PFF as “perhaps the best true free safety in the 2016 draft”, Byard played 656 snaps and recorded an overall grade of 78.9 which ranked second among rookie safeties. 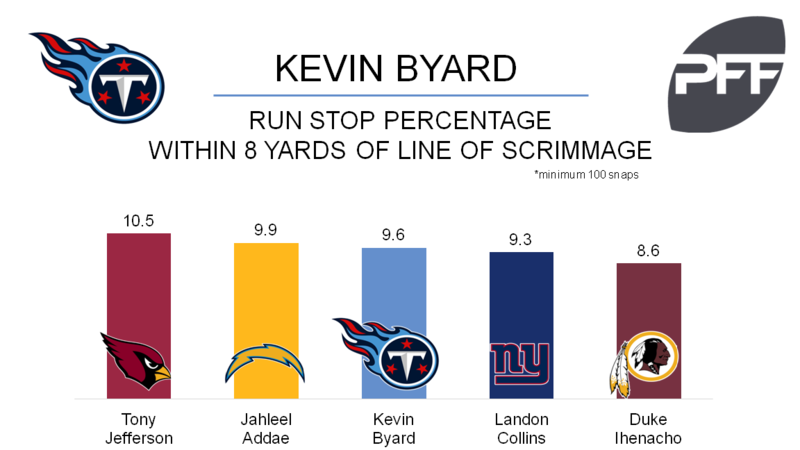 Byard’s run-stop percentage of 6.3 ranked in the top 10 among safeties, and was third with a run-stop percentage of 9.6 when playing within 8 yards of the line of scrimmage. Albeit on just 25 targets where he was the primary defender, Byard was also fourth among all safeties allowing an extremely stingy 0.22 yards per coverage snap. With the Titans addressing their secondary through free agency and the draft, Byard building off his impressive rookie season would certainly be a huge boost to the defense.